I remember reading the Famous fives, Nancy Drews and Hardy boys and wanting to be like them. Only all attempts to do so failed. I wanted to drink ale as the characters in most English stories but when I asked around half the people did not understand what I said and the other half thought I had gone mad(Now I realise they were probably right). I also wanted to have blue eyes (Only looks good if you are white. Thank God for not listening to my prayers. God knows best!). Then I read about these kids going to their aunt or granny’s place for vacation and we did that too 🙂 These well-behaved kids helped their aunt with setting up the breakfast table and some household work. And since I was a very good kid too, 😉 wanted to help my gran. So one morning I went into the kitchen and started helping with some random stuff when I heard someone shouting from behind “You haven’t taken bath yet. Why are you touching those Prasad plates?”(For the uninitiated Prasad is an offering to God during Puja/religious ritual). And here I thought I am helping. This is not going to deter me, is it? I took a bath came back to help when I learnt that I am too slow, don’t know how to set up the Prasad plates, … and a million other ritualistic nuances I didn’t even know existed. That was the end of my “help elders during vacation” story. At least I thought I will do something adventurous and save some kidnapped kids from the nearby caves. But as it turned out, there were no caves nearby neither did any neighbourhood kids get kidnapped. That ended my hope of being like those characters. I was disappointed but also learnt the hard way that real life is different. I always thought I’ll own a convertible just like Nancy Drew someday. There still I do have hope 🙂 (I am optimistic you see). I still get influenced by the books I read only now I am more selective of what I read and the influences are more subtle. And I am quite sure it is true for a lot of people. Which is why we need good stories especially the ones we read during our formative years. Which are the stories/characters who have influences you most? Have you tried being like any of them? Something like “Main Madhuri Dixit banana chahati hoon”? ← Pirates go bankrupt because of piracy! Nice! 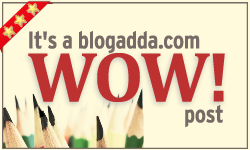 My blog is eight years old now and has given me immense satisfaction and joy! I’ve loved every moment of it, though I haven’t really spent any time promoting it. It has been my place that I write, think, muse, experiment and hopefully entertain. I hope your blog is all that to you too….enjoy blogging. All the best Sapna for more blogging years ahead. I think it is great to remember your childhood at times. It keeps you grounded and human.